The innovative design of our Over Axle Bracket relocates the original front trackbar mount to significantly reduce the acute operating angle on lifted Jeep® applications. The bracket effectively moves the lower trackbar mounting bolt location approximately 4" vertically and 3.75" laterally. An additional mounting hole is located a full 1" higher to accommodate extreme Cherokee XJ applications with over 8" of suspension lift. Laser cut and CNC formed for accuracy, the Over Axle Bracket is constructed of premium 3/16" steel, with even thicker 1/4" material used in high stress areas. 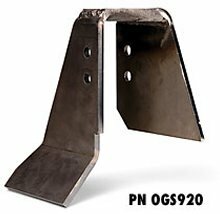 The bracket welds to the axle housing at the coil spring pad and axle tube for maximum support and accommodates the OE trackbar mounting bolt.